Level 1 / Level 2 / Level 3 – Elite. Looking for a friendly trampolining club in south west London and north Surrey? Come along and join us for a class. We’d like to meet you! We are a leading trampolining club in the UK – Kingston trampoline academy. We offer trampoline classes for all ages and abilities. Based in South West London and North Surrey, we offer leisure, athlete and adult trampolining lessons. 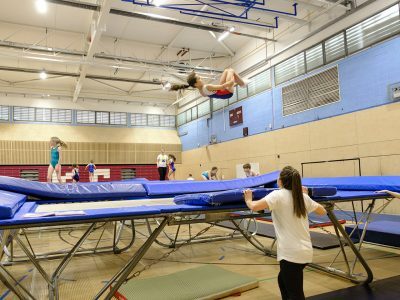 Trampoline gymnastics is exhilarating and so much fun at our trampolining club. Within the safety of the Academy setting, our focus is to help our students enjoy their time with us in ways that exceed their own expectations of their capabilities and what they can achieve.We help them to make their own memories of their achievements at our trampoline club. We celebrate and capture their wow! moments and ‘Firsts’ in our trampoline lessons. 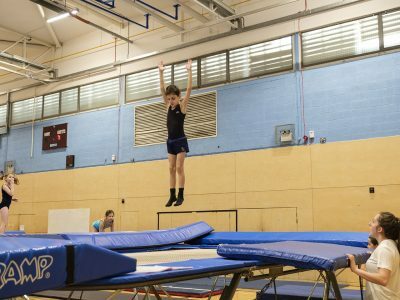 Competitive trampoline gymnastics is exciting, exhilarating and so much fun at our trampolining club. 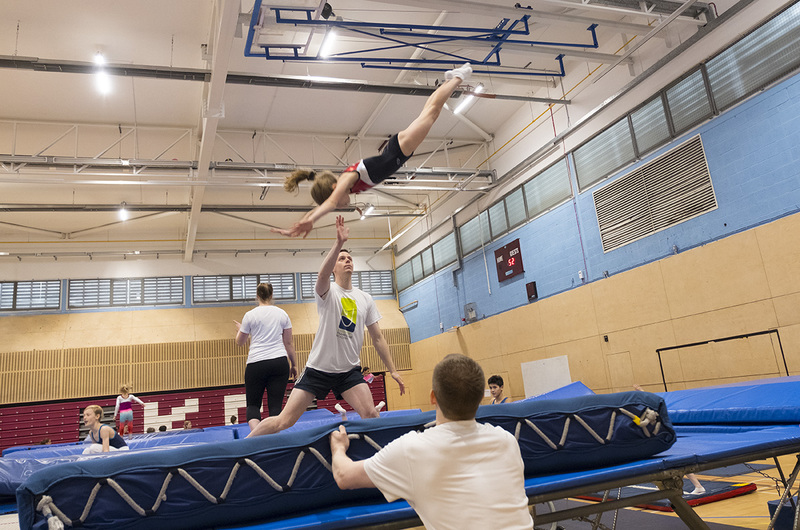 In our trampoline classes, we provide the motivating and focused sense of team, challenging and supportive coaching and the guidance required to make it to the highest levels of trampoline gymnastics. 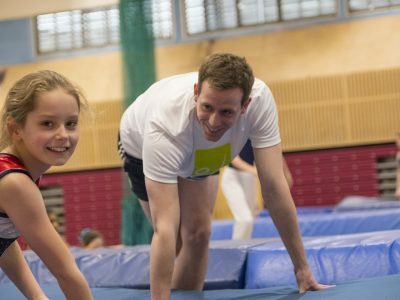 We're a trampolining club that's focused on helping you enjoy making the most of trampoline gymnastics, whether that’s for fun or striving to be the best in the world. In our trampoline classes, both recreational and athlete, we help our students to exceed their own expectations and most importantly have fun in a safe and controlled environment. Our promise: To make the most of the time that you are with us. This vibrant and exciting Academy is run by Andrew and Michael Freeman. Both are Master Gymnasts and with 4 world titles, they are highly experienced and accomplished at world championship level competition. Michael and Andrew set out to emulate their success by enabling others to enjoy and be successful in trampoline gymnastics. 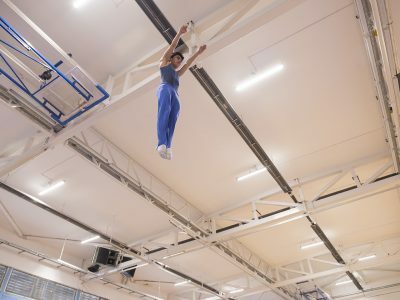 “We’re on a mission to enable our members to enjoy trampoline gymnastics in ways that exceed their own expectations of their capabilities and what they can achieve. Making Memories. For all our students. The excitement of achieving way more than you ever hoped. Cherished memories that stay with you for life. Let’s make them! Chasing Dreams. For our athlete students. The excitement of the journey and the thrill of achievement. We’re with you all the way. Let’s go! Easter Closure: There will be no classes on Friday 19th April (Good Friday) and Saturday 20th April. Try our Frequently Asked Questions- click here for athlete and here for leisure. When it’s on! We can chat when we’re not coaching! Please use the box to the right of this page to send us a message Anything to discuss? Please call Andrew Freeman on 020 8941 7083 between 10.00-17.00 Monday-Friday.